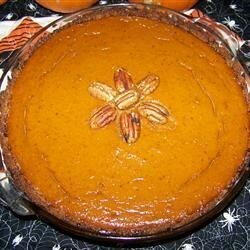 "A spicy version of the all time favorite pumpkin pie." Combine cookie crumbs, granulated sugar, and melted butter in a 9 inch pie pan. Press into sides. Bake for 5 minutes. Cool completely. Combine pumpkin, brown sugar, cornstarch, cinnamon, nutmeg, salt, vanilla, eggs, and milk. Blend with wire whisk until combined. Pour into crust. Bake at 325 degrees F (165 degrees C) for 1 hour. Let cool. Refrigerate to chill. I thought this pie recipe was great. Didn't have quite enough gingersnap crumbs so added some vanilla wafer crumbs with it and it worked fine. I certainly will make it again. Very good. A nice twist on traditional pumpkin pie.